Lambda Technologies engineers have extensive experience determining the crystallographic “texture,” or preferred crystallite orientations in a wide variety of materials and forms. Much of the instrumentation and virtually all of the data collection software have been developed in our laboratory to meet the specific specimens and testing requirements of our clients. Orientation Distribution Function (ODF) analysis is provided by either the harmonic or WIMV (Williams-Imhof-Matthies-Vinel) methods. Techniques range from simple film methods to determine wire-drawing textures to multiple equal area net Schulz back-reflection pole figures. Data presentation ranges from peak ratio monitoring for quality control to full ODF analysis and recalculation of direct pole figures, inverse pole figures, and texture fibers. Pole figures are either stereographic or equal area plots of a specific (hkl) pole (or crystallographic direction) density for the individual crystals compromising the sample. Lambda Research has developed software for both data acquisition and reduction, which provides uniform resolution of data collection on an equal area spherical net. Most commercial pole figure software utilizes fixed equal angular increment data collection (usually 5 deg. ), leading to high resolution at the center and lower resolution at the edges of the pole figure. Lambda’s software spaces the data points evenly throughout the entire pole figure. Further, the pole figure resolution can be carried to provide high resolution when required or lower resolution for high-speed data collection and reduced cost. Through complete control of the data collection and reduction software, Lambda offers texture studies and data presentations providing the highest accuracy and testing efficiency possible. Schulz back-reflection pole figures using equal area data collection nets for optimum efficiency at spacings tailored to the application. Multiple pole figures obtained for selected (hkl) without sample remounting. Instrument positioning to the centroid of the diffracted intensity is performed automatically prior to data collection. Data presentation in either a true times, random or normalized format. Corrections for specimen transparency, allowing accurate texture measurement in thin films. Defocusing corrections can be performed either analytically or empirically. ODF analysis using popLA software and data file distribution to clients in popLA format. Inverse pole figure calculation from powder diffraction patterns. Film techniques for direct calculation of fiber textures. 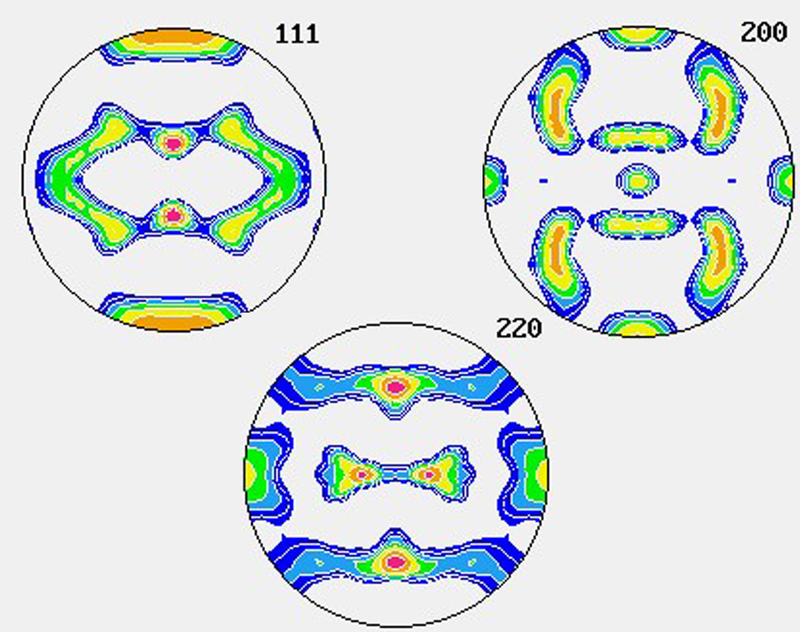 Monitoring crystallographic texture in zirconium and hafnium alloy nuclear fuel tubing. Texture development studies and quality control monitoring of texture in sputtering targets for a wide range of materials. 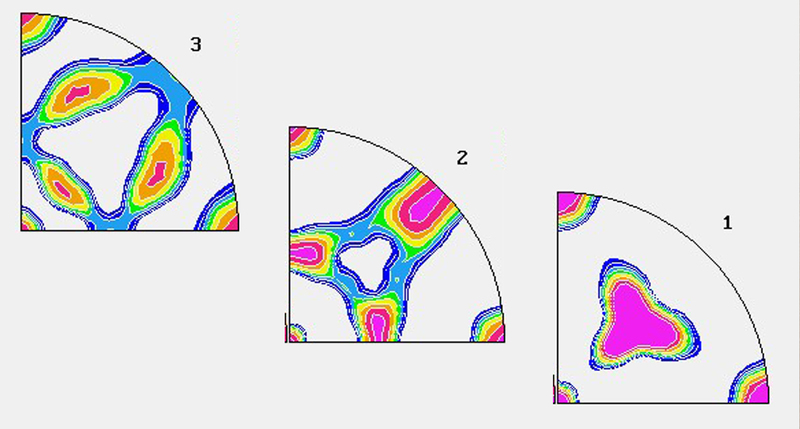 Quantifying textures developed by a wide variety of extrusion, drawing, casting, rolling, and coating processes. Complete Electrical Discharge Machine (EDM) and machine shop sectioning support for sample preparation. Facilities and techniques for tube thinning and elastic mounting for texture measurement in tubular specimens. Orientation ratios allow the integrated peak intensities from a diffraction pattern to be compared to the peak intensities of what a randomly oriented specimen would produce. These data provide information as to the degree of preferred orientation present for particular crystallographic planes lying parallel to the specimen surface. Unlike a pole figure, orientation ratios will not distinguish directionality within the surface, but may still provide useful information at a lower cost than a complete texture analysis. We can answer any questions you have about our testing parameters or techniques. Contact us by phone at (800) 883-0851 or email us here. Lambda Research Diffraction Notes, No. 14, “Analysis of Radially Symmetric Textures Using Partial Pole Figures”.